It is funny to think of what kids much think sometimes on lines that they hear on a song. I actually remember some of the things that I wondered about. I have decided to leave my Christmas stuff up for a couple more weeks. It has been cold here, and Texas is so BROWN everywhere that you look, so the colors of the lights are something I am still enjoying, makes me feel as if there is some color somewhere. Love getting up early and lighting the pellet stove and enjoying all the lights. I usually take all my stuff down too before new years. Yes it does feel like a long an dark time now till spring, but i am also ready. Have a happy new year lisa! I write about it a lot... I HATE WINTER! That girl photo is nifty . . I thought you were going to tell us it's your grandmother . . . You surprised me - She just had the photo because it's wonderful . . I'm glad. Thanks for sharing it. Oh I am glad Pierce is OK and Cort. I still have my tree up and want to get it down but am too busy too. I love Winter but not this Arctic Winter we are having I would rather have more snow less cold. I love looking through old family photos! I am counting down to spring too, it has been one cold winter! oh my you'd hate it here some leave the decorations up until the end of the month, at home my husband has compromised they'll come down on the 7th! Glad Reid's sick time came and went so quickly. I inherited too many photo albums with names and dates but love them all the same tho it would be nicer to know who is who. I am not a cold weather fan either. I get tired of putting on layers and layers of clothes, listening to the wind howl and being cooped up in the house. I am lucky that we have to go out to chore every morning! They are calling for an extreme cold front this weekend -50 to -60* including the windchill. Glad Reid's rash/hives were not serious. I bet is was kind of scary for a bit. January in my month for snowman decor! I cleaned house last night and had fun decorating with snowmen. Oh my goodness my oldest son got dog sick week before last. As in go to the ER thinking his appendix was busting. The week after Christmas was ok then on Sunday he literally had welps rise up on ONE half of his body and they spread like wildfire. Some even looking like blisters. Another trip to ER for we don't know. A trip to Doctor the next day who said not allergy, not cellulitis more likely viral rash. Steroids and phenegran for the nausea it came with. He literally slept and fevered for 3 days straight. New Year's Eve he was a new person. Strangest thing I had ever seen. But he left his funk on the rest of us and like you I don't have Christmas down yet.. sighs.. I'm with you on the Christmas take-down. I celebrate from Thanksgiving to Christmas day and after that- it's outta here! I'm pining for spring too- if it weren't for Christmas, I would as soon skip this season all together. My granddaughter has been having some strange hives pop up the last week. We thought food allergy until it happened hours after she had eaten. Strange. An extremely cold day like today does have me at least thinking about spring, though I usually love the cold. :-) I'm glad Reid's rash cleared up. I used to break out in hives, and the docs never figured out why. Our trees are still up, unless Larry is taking them down while I'm at work. I decorated them, so he should undecorate them, don't you think? The photo is delightful! What a treasure. Took down my decorations yesterday; so glad to have my house back. get out and play more is how I enjoy winter. Headed out to sled today. I totally feel you on #5. The older I get the less I like winter. I'm already dreaming of spring! January and February are tough months to get through. January and February always drag on for me too. That old photograph is fascinating. I'm with you on the Longing for Spring.... it can't get here soon enough! Dare I say I didn't even decorate this year? Celebrating two weeks early just left no time for it. I am not a fan of winter, either. I wish we could just skip from Fall right into Spring. Wouldn't that be grand? This winter feels long already to me and that's rare. But the COLD. So much COLD. I take down our stuff Jan. 5th. Old photos are such fun to look at and wonder about, aren't they? That type of rash has happened to my son before when he was younger. Strange and unsettling. Glad he didn't suffer too long. Oh my goodness, I love that picture. So sweet! I am looking forward to Spring too! We hope the rash gets better soon! We want spring now too- and more daylight in the evening and some warm weather! I'm not a fan of winter either. I'd like to go straight from Christmas to spring. Sorry the little guy got sick. I'm glad it was not anything long lasting. That's an old song. I see his point. 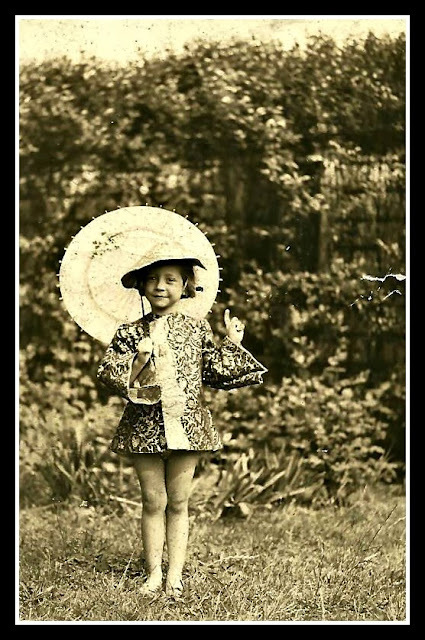 The photo of the little girl is wonderful -- a great treasure! Glad Cort is okay and we never know what will come out of the mouth of babes. I think snow is pretty -- would like it better if it didn't come with the cold and mess. Probably why I live on the Gulf Coast! Happy New Year! Love the vintage picture. I too, keep telling myself only two months to get through until it is March. Enjoy each day. They fly by so quickly. I'm going off to sit with a hospice client this afternoon. She is 70 with ALS and cannot speak. Even though we live in FL, it has been unseasonably cold; and they're predicting 24 in a couple of days. When my mom was sick with cancer she had be find the big box of pictures..black and white.. We went through each picture and she talked about who was in the picture and told a story about that person.. Ohhh,,I just loved it.. BUT did I write on the back of each picture the name of the person in the picture...NOOOO~!..my mom passed away and I have the big box of pictures and have no idea who anyone is...: WARNING: if this happens to you take time to write on the back of the picture . Even if it's your own pictures. Also, thank you for visiting me! We took down our decorations early too. On the contrary, I would die if New Year's came without the decorations still in place. We usually take them down 1 week after, but this year we cleaned everything yesterday, being weekend and all. I like to take everything down on New Year's day--and it's such a JOB! I hate doing it, but it is nice to have the holidays packed up and put away. I like old pictures. There is something unique about each one of them. Oh my I hope Reid is feeling better. And you will the Christmas down soon. I am sure I'll need to explain the "mud on your face line" to someone here eventually as the radio is always on.